Get Off the Bus, Gus! I could have stayed on the bus. No one would judge me for it, and there would be plenty of opportunities to connect with other Armenian families later in the day. I knew today’s story didn’t need to be THIS story, of a 12 year old boy in need of a sponsor. I got off the bus, but you probably knew that already, didn't you? You knew that even though life is hard, opting IN is what helps me. It’s what keeps me going and tethers me to the world in a healthy way that I could not have taken for granted just a few years ago. I had read a little bit about Nikol’s family early this morning, and I wanted to learn more, so I walked up the snowy path past the huge haystacks and into Janet, Andranik, and Nikol’s stone house. 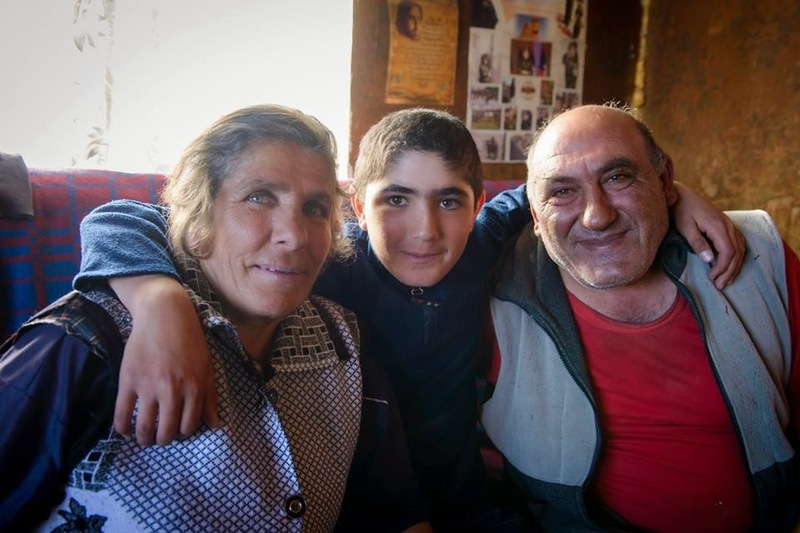 It was spacious in comparison to the house we would visit next, which was actually a cramped metal boxcar intended for temporary use following Armenia’s earthquake 27 yrs ago, now all these years later serving as a permanent home for a family of five. 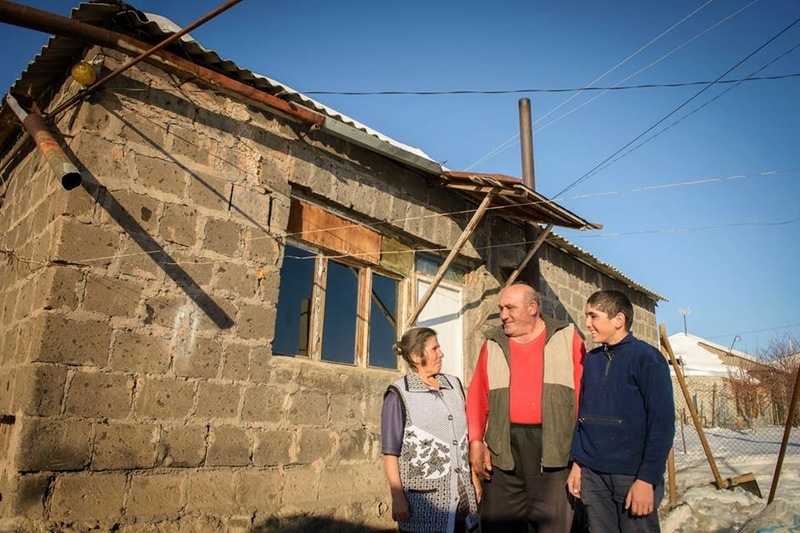 But Nikol’s stone house, while spacious, is falling down around the family, who can not afford to make repairs. 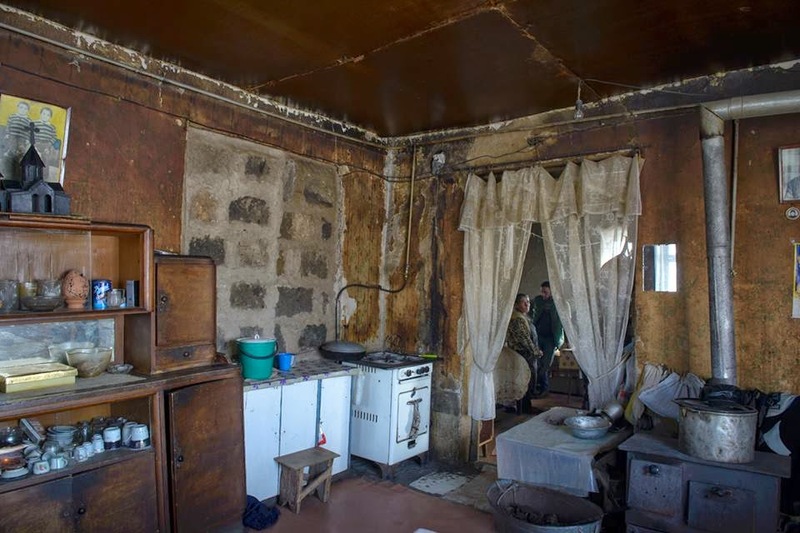 In fact, Nikol recently changed where he slept because he is terrified the roof will cave in on him in the night. I’ve joked a bit about my age on this trip, as I am quite a bit older than the other bloggers. I mean, I can’t believe I worried whether or not I should wear skinny jeans on the trip. These young bloggers are hip. And my use of the word "hip" just now pretty much shows that I’m not. However, when I meet Nikol’s parents, who are 52 and 56, I would not have been surprised to learn they were in their 70's or older, so harsh have the years been on them. 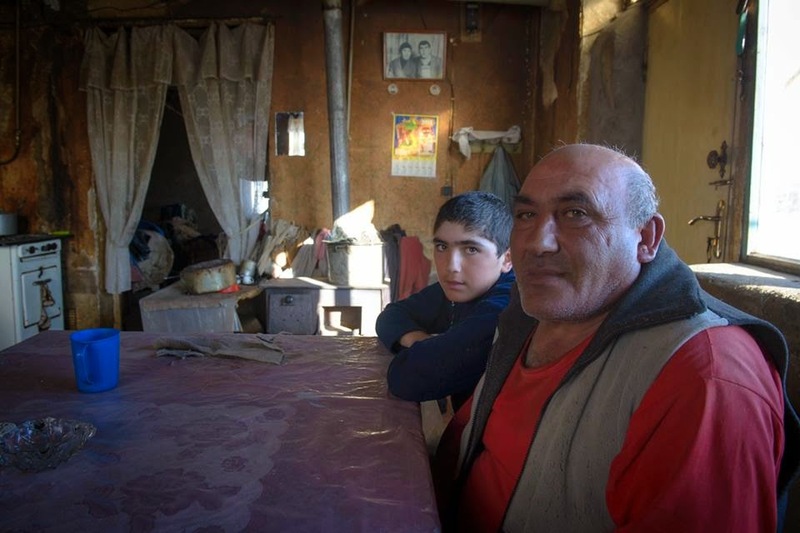 As it is, they are as old as many grandparents in the region, and it is a cause for regret that they are barely able to feed their family at this stage in life, let alone spend money doting on their adult children and grandchildren. As part of the old guard who remembers living under Soviet rule and having all of their needs met, Janet and Andranik find their current reality hard to fathom, let alone accept, but they have no choice. 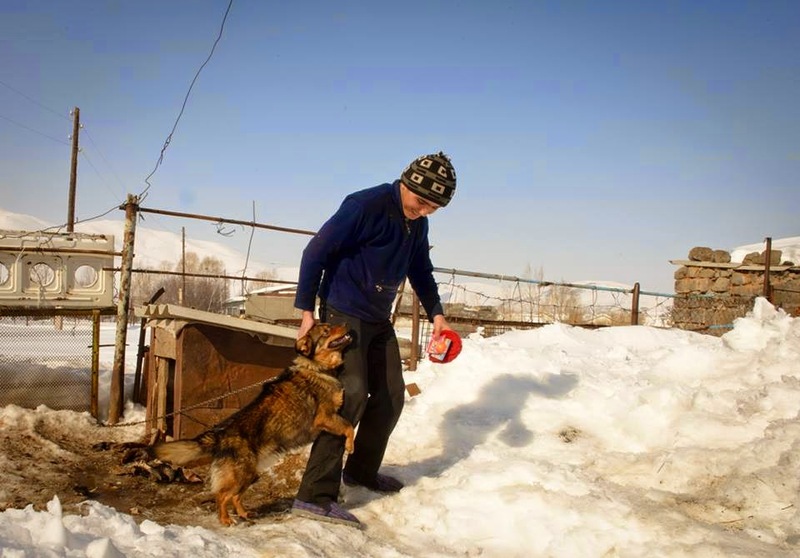 Despite various physical ailments, they, along with Nikol, walk to a neighboring area twice a day to care for someone else’s farm animals. There they are surrounded by manure, but are not allowed to take any home to heat their house. 3 hours of labor in the morning, and 3 in the afternoon, done by the family together, yields a total of $1.40 a day. Enormous debt the family has carried for years (with interest rates up to 36%) looms over them, spreading a feeling of hopelessness and despair. 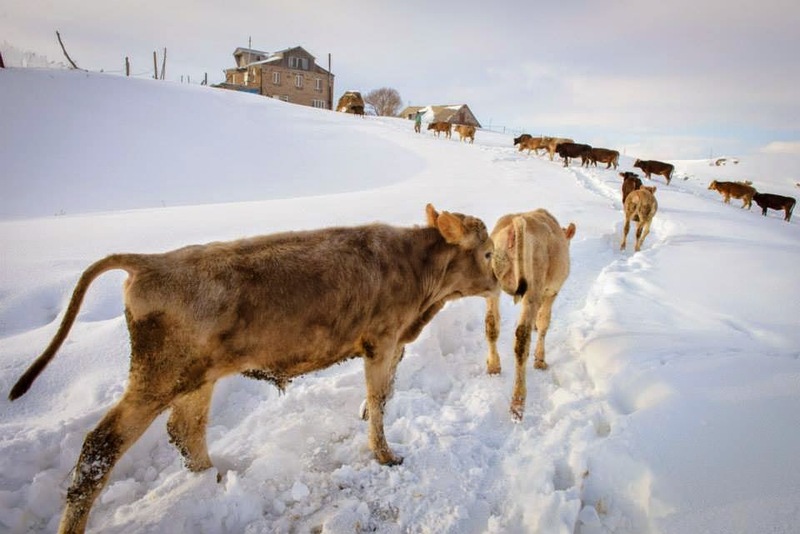 When winter is over, the cows will be taken elsewhere, and that meager job will disappear. 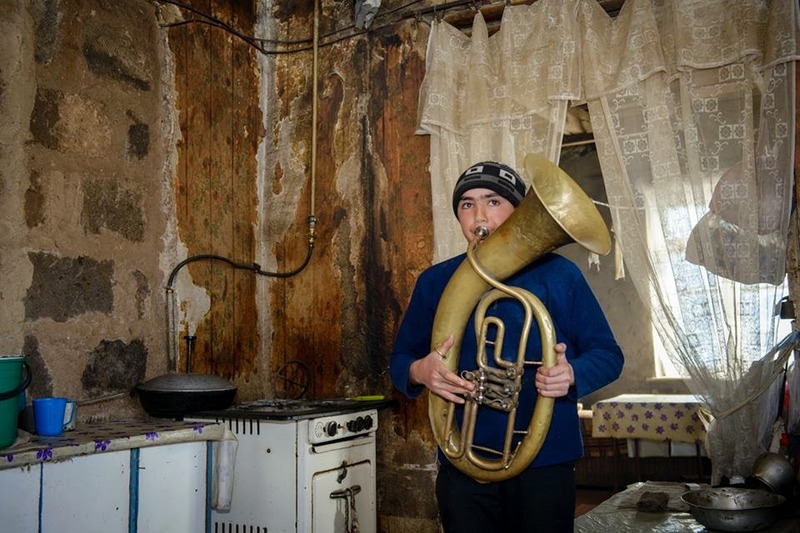 Yet here is Nikol, with his huge brown eyes and ready smile, who shows us some Judo moves (doing a few on me at my request), plays a few notes for us on a Euphonium, and tells us about the World Vision summer camp he attended last year. He is playful, respectful, curious, and kind. Our guides will tell us later that it is hard for him to make friends because in such a small village, his abject poverty sets him even further apart from his peers. When Nikol opens his notebooks to show us his drawings, I feel a pang, but in a good way, thinking of my own brown-eyed boy and how each of his interests became our own and how he was (and is) a light to us as Nikol is to his parents. We find out that Nikol’s school is going to start requiring students to have a computer, and that his teacher already gives out links and websites as part of assignments. To hear the words "links" and "computer" while standing in a room with a collapsing ceiling, a water tap nearby in the yard, and an outhouse down the way, is jarring and incongruous. How much more will these loving parents borrow just to get what they need for Nikol? When an elderly woman prays that her ailments and stiff joints will ease up enough to allow her to milk another person’s cow in the hopes they will have enough money to PURCHASE MANURE, how ridiculous does talk of computers sound? 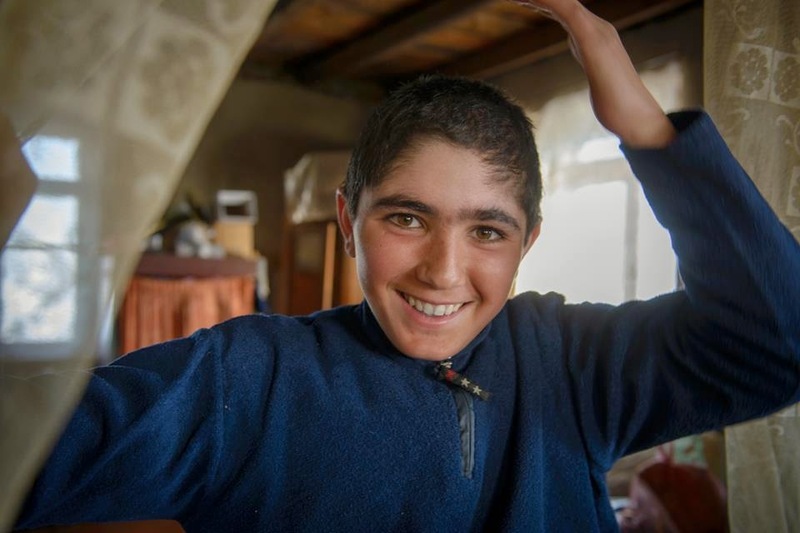 What about Nikol's father, unable to use one of his arms because of a war injury? Where do computers fit in his reality, which at first glance looks like stepping back in time to a century ago? I don't know, for although they are kind enough to invite us into their home, to open up about their fears and struggles, I cannot truly put myself in their place. And I know right then, even though a tear has slipped out of my eye. Even though I can't transport the parents back to their youth, when life looked so very different from this daily struggle for survival. Even though I can't wipe away the debt. Even though I can't help Nikol fit in the way every middle schooler wants. I know that Nikol will be our family's next sponsor child. 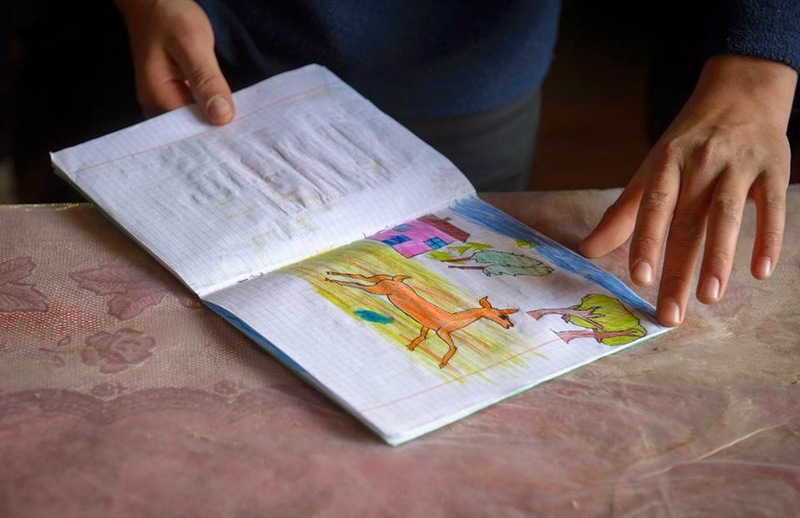 There are other children in Nikol's village who are in need of sponsorship, including his one of his nieces and his nephew. Here's information if you are interested. “I have my children with me and there are healthy,” she beamed. And in that moment, in the run-down 2 room house on the side of a snow covered mountain, I envied her. I wanted what Aida had, all of her children healthy and with her. We had asked, after spending some time in the tiny home, with its saggy plywood floor, sooty walls, and three narrow beds for 9 people, what she found joyful or beautiful about her life. 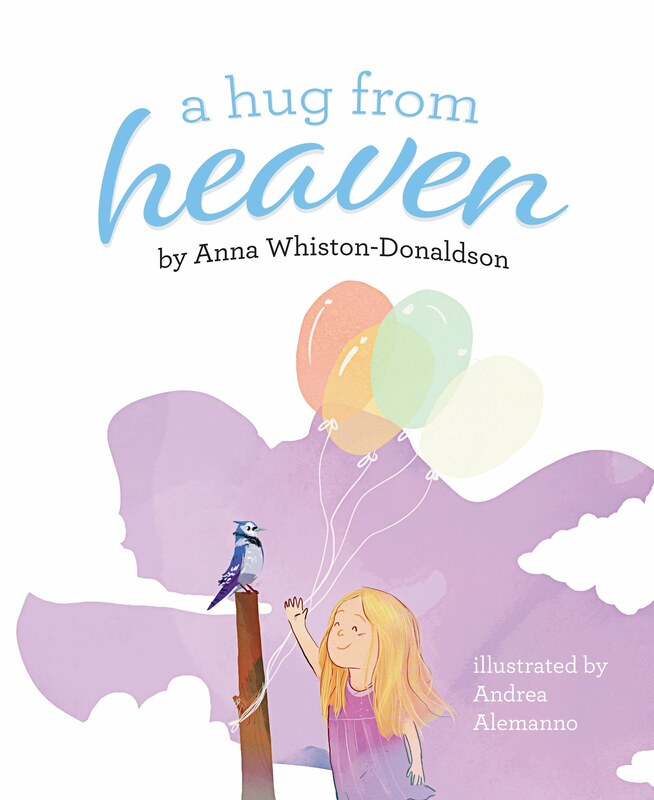 It was natural to want to end on a high note for this mother, only 28 years old, who had generously opened her home and life to us. 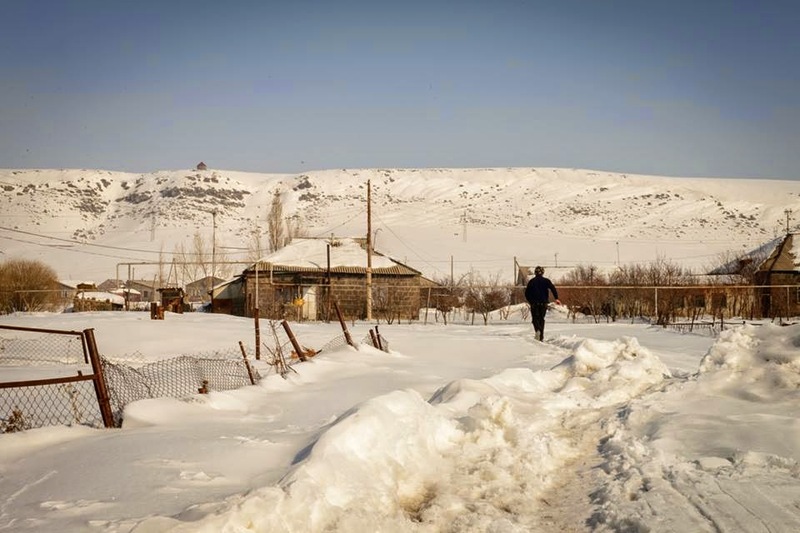 She had answered our questions about the ways her family barely subsists in this tiny Armenian village, where winter can last up to 9 months a year, and jobs are scarce. 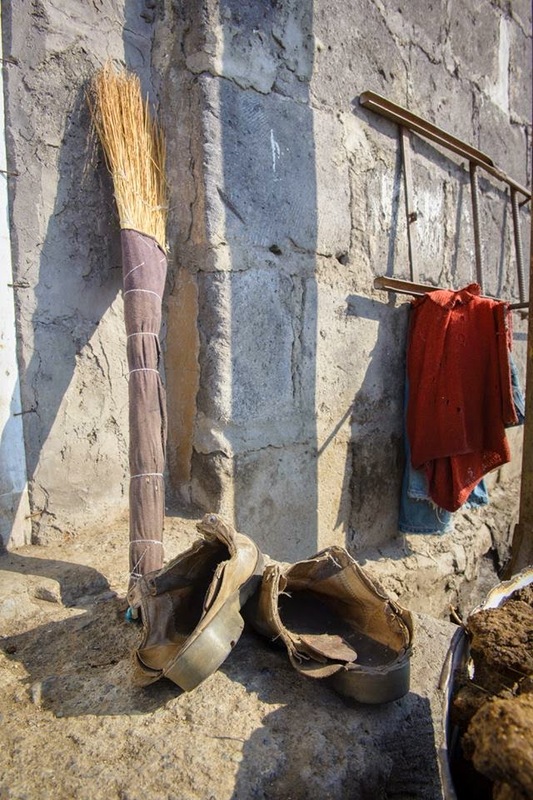 With nowhere to go outside in the deep snow, and only one pair of boots for all 7 children, Aida’s family life takes place in these two rooms, each only a little larger than my bathroom at home. The burden of rent is often too much, and the landlord threatens to kick them out, adding a larger dose of worry to Aida’s plate. The small wood stove used for cooking, washing, and heating water for bathing, is fueled by cow dung, but Aida’s family does not own a cow. 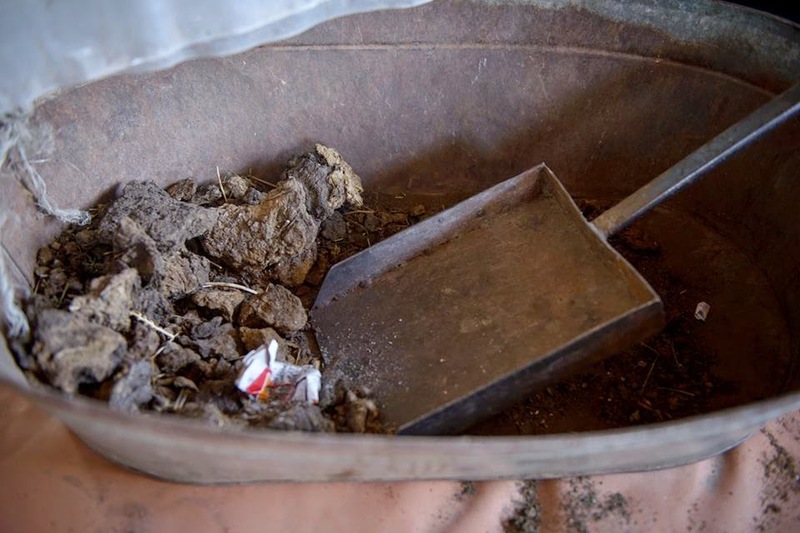 Her husband muck stalls for someone else in order to earn a very low wage plus get cow dung for the family. Even though World Vision is just beginning to establish a presence in their region, Aida’s family and the others in her village will eventually benefit from all that sponsorship offers: parental training, agricultural training, nutrition programs, child protection, Sunday school, and economic development opportunities for the parents. 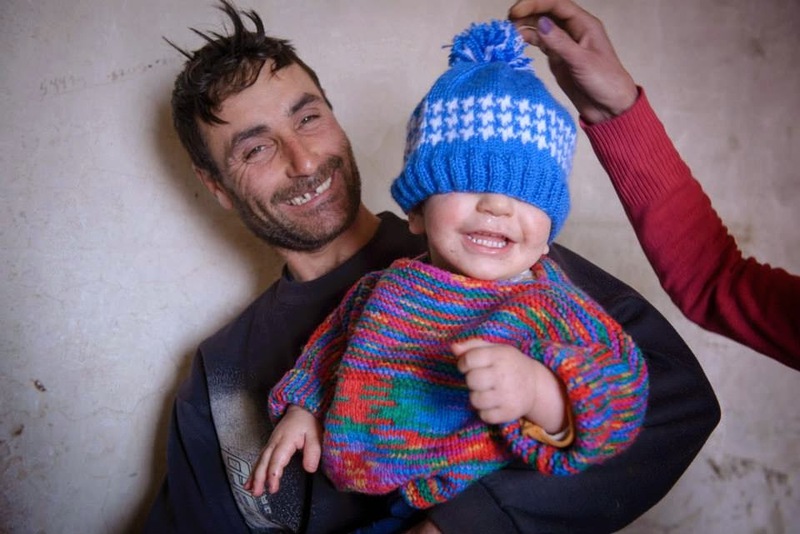 The good news is that while those programs will take a while to establish, Aida’s family has already been identified as extremely vulnerable and will be given help in the meantime. In fact, we were able to deliver the news that because of a donation made through a World Vision Gift Catalog, their electricity bill had been paid and the electricity will be turned back on after a week of being off. They will also receive an emergency food kit. 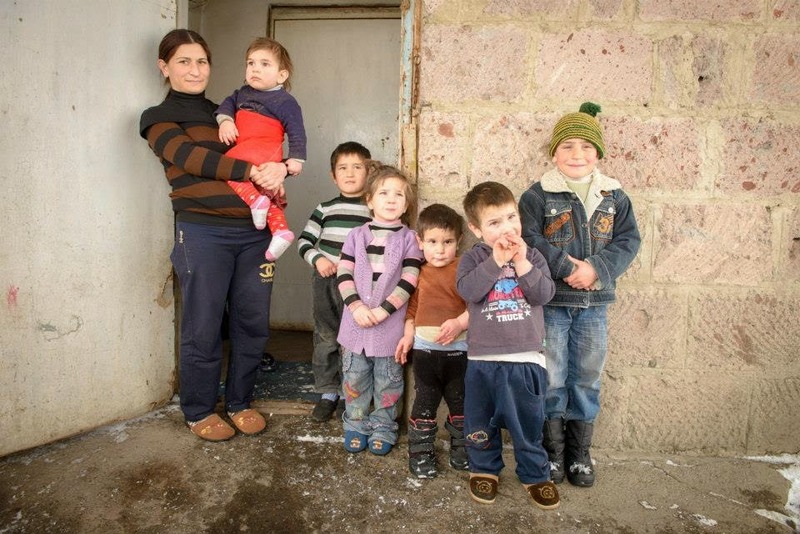 Aida IS grateful to have all of her children healthy and with her. It is what every mother wants. But behind her warm smile as she holds her adorable second youngest, is likely another desire: to make a better future for her children. I'm guessing some days that seems impossible. No, I am not jealous of Aida. That unwanted flicker passed in an instant as it does on many of my days, but now Aida holds a place in my heart as one mother-woman to another. And I've got to tell you, that after just a few minutes in those little rooms, it became harder and harder to see the lack, even though it most certainly was there. 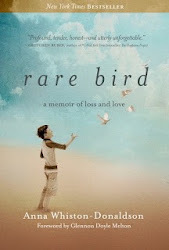 Somehow, the warm intensity of mother-love made the rest start to recede from view. Child sponsorship is the backbone of World Vision’s programs. I get to meet my new sponsor child, Anahit, tomorrow! You can find out more about child sponsorship here. After a long 24 hours or so of travel, which may or may not have included a frenzied run through a Paris airport when our terminal and gate were switched (which may or may not have resulted in an early need for the spare undies in my purse) I'm in Armenia. I'm hanging out in my comfy hotel bed waiting for the rest of the capital city of Yerevan to wake up. Today will start with breakfast and devotions, then we will hop in vans to head to another town, about 1.5 hours away, which will be our home base for the week as we visit World Vision development projects and meet with Armenian people in their homes. Learning more about the other bloggers I'm here with. Learning about this beautiful country and its history at two museums, including the Armenian Genocide Museum. Learning about the customs and language of the Armenians as we pepper our generous guides with questions. I'm so glad you will be here every step of the way! P.S. To learn about child sponsorship through World Vision, check this out. 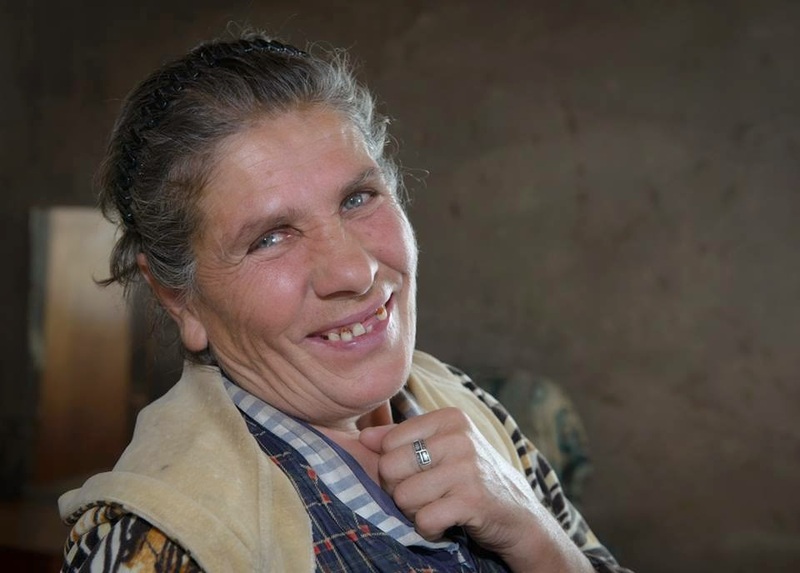 In less than a week I'll be in Armenia, as part of a World Vision "Vision Trip." We received our itinerary yesterday, and I'm both excited and apprehensive about what's ahead. Most of our time will be spent meeting families in their homes and seeing needs first-hand. The trip is in the winter so that we will be able to witness the harsh conditions so many Armenians endure during the coldest months. I'll be meeting real people with real stories, and sharing those stories with you here and on Facebook. In my experience, once you see something and know something, you can't go back to a place of unknowing. This is usually good, but rarely easy. For example, in my life, I've gained the unsought knowledge of how fleeting life is. I have seen what our family hoped for be stripped away in seconds, and I simply can't go back to a my prior place of unawareness. When I travel places where life is much different than my own, I also gain perspective or knowing. It is often humbling and sometimes overwhelming, especially when needs are so great. It's daunting. I'm grateful there are organizations like World Vision who are working in big and small ways to alleviate suffering around the globe. And the beautiful thing is we are invited to share in that. It is my greatest hope that my heart will be open to the people I meet and that as I share my experience, more children will be sponsored through World Vision. Jack's 16th (gulp) birthday with be shortly after I return from the trip. For many of you, Jack's story is what drew you to this blog for the first time. Wouldn't it be wonderful if children get sponsored as a result of this blog, right in time for his birthday? I managed to convince Tim to binge watch 4 episodes of Homeland with me over the course of Valentine's weekend, which was a win for sure. Not that there's anything romantic about Homeland, but I'm currently obsessed with and I want to get as far into it as possible before I leave for Armenia. Another weekend treat was that Tim got an extra short haircut, which left him looking about 25 years old. I knew he was young looking when we met, but I never thought it would be much of a problem. Remember the time we were going to an R-rated movie (as married, pregnant, minivan driving homeowners) and he got carded? Sheesh. It's no secret that I've always looked a bit older than Tim, but I've held out hope that we would eventually fade at relatively the same pace. With all of Tim's marathon running and juicing over the past several years, I've had a few alarming experiences where I've looked over at him and seen someone who looks a lot more like Adam Levine than the Danny DeVito-esque middle-aged husband I expected. He just keeps getting hotter. Not that most women would complain, it's just that I appear to be aging more like Bea Arthur than Cindy Crawford, and Tim's dashing looks and Benjamin Button-like aging process are making it hard for me to coast into my middle-aged glory days like I thought I would. At least his lack of finesse in the romance department takes some of the pressure off. Last night we were watching something on TV with Margaret (not Homeland) when he slipped a little piece of paper into my hand with a smile. It was one of those little squares from our Valentine's Gratitude Box. I assumed it would be romantic and at least PG-13. I turned aside so Margaret wouldn't see what it said, but I could have saved myself the trouble. Instead of a love note, it was a folded up Chipotle receipt. I burst out laughing as Tim frantically patted down his pockets trying to locate the note he had intended to hand me. There are still a few days left if you would like your family to do a Valentine Gratitude Box (or jar or basket). It's one of my favorite family traditions. I love having that little pink box brighten up our kitchen on the sometimes chilly, dreary days leading up to V Day. And speaking of cheering up. Do you see that little bit of yellow peeking out there? I found a small café chair at the thrift store for $2.50 and gave it a (kind of sloppy) coat of spray paint this week to add more color to the kitchen. I ran out of paint, so don't look too closely. Want to join me for a mug of tea? We sit around the large table in the title office, signing papers to refinance our house. Our mortgage broker is a friend from church, and the head of the title company is a friend and parent from Jack and Margaret's old school. The last time we were all around this table together was years ago when we refinanced our old house. A lifetime ago. Before the accident. Before we changed houses in an attempt for Tim and me to put on our own oxygen masks even though we knew it would be difficult for Margaret to leave. Before our tragedy dragged these families into a dark place with us. What light banter was there that other day? Surely it was about our kids, all around the same age, at that point approaching tween-dom and teen-dom. Today, I'm just trying to get in and get out so I can cry in my car. I ask my friend how his new house is, and he happily tells me of his kids' friends in and out all day. It sounds so much like our past, but nothing like our present. I know every family has a story, and no one is free from hardship and despair. It does me no good to wish we could switch lives, switch families, switch futures. But oh how I wish we could just go back to that other year, that other time around the table. Afterward, I go to the grocery store, purposely taking one of those mini carts, pissed that our food for the week will probably fit in it, 2 pathetic yogurts here, 3 lonely grapefruits there. I haven't felt this sad and angry in a while. But then I smile broadly at an old man at the freezer case, wondering if he needs some human contact today. He is grimacing. It would be difficult not to notice his sturdy shoes, white socks, and bare legs under his trench coat. It's 30 degrees and windy outside. "Well," I tell myself, "at least I'm still putting on pants." Not that it seems right to feel better just because someone's backstory (which I've somehow spun between the ice cream and the frozen peas) could possibly be as bad as mine. And, for all I know, he's going to jump in his sports car with his 40 year old wife and head off to play racquetball in a few minutes. Perhaps I'm making his story sadder than it is. But when I look down at my dress, navy tights, and boots I think, "Getting dressed is something. You did something. You are doing something." A few aisles over I see a mom and grandma calling out in Spanish to a child who has disappeared from view. Their voices are mildly irritated and not at all panicked. I feel it too, that calm that it will be all right, that he is just over looking at cereal or cheap racecars or the deep bin of discount DVD's. I linger until they are reunited, his hand grasped firmly in his Abuela's. I smile at his chubby little face. This makes me feel better too, that I can still rejoice in the good, in a happy ending, even though it's not ours. I think of Margaret at school, how on just a few hours of sleep because of our late flight home from FL, she'll have to interact and learn, be surrounded by 800 people, come home and do homework, and then go to soccer in the cold. Here I am praising myself for getting dressed and buying grapefruit and she is doing 1000 more things than I am today. I'm so proud of her. And Tim at his office, playing catch-up after time away, buried under papers, using his brain on complicated equations that would baffle me. I'm proud of him, too. I head home to clean a little, do laundry, make appointments, and play catch-up in my own way. I still feel fragile and weepy. It could be because my period started. Or it could just be a burst of grief. Or perhaps it's the emotional release of having gone on another vacation without Jack-- of mini-golf, warm sunshine, and sand under our feet-- that would have seemed impossible just a short time ago, but that we did and we enjoyed. I don't know, but I let myself cry and be proud of myself, too.